This lovely waterfront home is only 20 min. away from Chincoteage & Assateague. Enjoy Resort-Style Amenities at Captain`s Cove - 3 Pools, Golf, Marina, & More. Bring your boat or fish & crab right from your own dock. Decks galore on this fabulous home to relax and enjoy the bay breezes. Only a 15 minute boat ride across to Chincoteague Island. Bedroom 1 on first floor features Queen Bed and Coastal Decor. Upstairs, you`ll find a lovely Family Room with views, views, and more views. Rich colors & comfortable furniture make this an amazing room to relax in - and again with those views. Lots of open space in this Reverse Floor Plan home - A great place to spend the holidays. Words cannot express enough how these views will move you. Imagine enjoying THIS view while cooking dinner. The huge, well-stocked kitchen will delight the Chef in your family. This would be an awesome home to spend Thanksgiving with your family. Plenty of seating at the Breakfast Bar, as well. Enjoy some amazing ESVA crabs as you watch the sunset on this awesome screened porch. Many furnished decks make enjoying a cocktail on the water extra special. Dolphin-watch right from your deck - they come very close in during the Summer. Catch small Sand Sharks right from your dock at night. Nautically themed Full Bathroom with privacy barrier. Full Bathroom has tub/shower combo and lots of space. Bedroom 2 is upstairs and features 1 Queen and 1 Double Bed. Bedroom 2 also has a Flat Screen TV and sunny sky lights. Spectacular Master with King Bed and soaring ceilings. This gorgeous Master Bedroom even has his & her closets. Enjoy morning coffee on the private deck off of your Master Bedroom. Bright & Sunny Sitting Area in Master Bedroom with gorgeous views. Huge Master Bathroom with 2 rooms. Pamper yourself with a soak in this incredible Jacuzzi Tub. Master Bath features a huge walk-in shower. Large Vanity in Master Bath and lots of privacy. No one likes doing laundry, but you`ll love the convenience of this Full Size Washer & Dryer. Just a short ride by car or boat to Assateague Island where the ponies roam free. See the warm glow of the Assateague Lighthouse from your deck. Amazing amenities at Captain`s Cove Golf & Yacht Club. Marina just around the corner to drop your boat, kayak, or jet ski in the Bay. The sunsets over the Chincoteague Bay are stunning. The Keys has nothing on our Eastern Shore sunsets. Right from your own backyard....wow. Serenity Now - It's exactly what you need! Welcome to Serenity Now in gorgeous Captain’s Cove - one of the best kept secrets on the Eastern Shore of Virginia! This spectacular Vacation Home will make all your dreams come true with something for everyone in the family. Located directly on the Chincoteague Bay, this home is only 20 short minutes by car or boat to Chincoteague & Assateague Islands, where our wild ponies roam free. Looking for some OC excitement? Ocean City, MD is a short 45 minute drive away. As you drive down Blackbeard Road, it’s hard to keep your eyes on the road - you’ll want to stare at the Bay, only steps away. You cannot wait to see where you’ll be spending your ESVA vacation. As you come around the bend and see this gorgeous home, you know you made the right choice. The first thing you will notice is ample parking for 4 cars, and a double garage perfect for storing all your toys, kayaks, beach chairs, and more. Upon entering Serenity Now, you’ll head upstairs and be utterly captivated by the views. The first thing you will notice is a wall of windows facing the Bay - the views are amazing! This level features a large Living Area with beautiful, comfortable furnishings with a Coastal flair, and new carpet throughout. What a great place to relax and enjoy the Flat Screen Satellite TV with VCR/DVD. Wistful blue built-ins are loaded with books and games for you to enjoy with your family. The Fireplace demands attention with custom Coastal Artwork painted on the mantel. There is a Queen Sleeper Sofa in the Living Room, just in case you need some extra space to stretch out. Also on this level is a gorgeous Queen Bedroom with a Tommy Bahama flair and a Full Bathroom with tub/shower combo. This dream home is the epitome of the Open Floor Plan, as the Living Room leads into the huge Dining Area with room for the whole gang at the dining room table and breakfast bar. The enormous Kitchen will thrill the Chef in the family - talk about cooking dinner with a view! 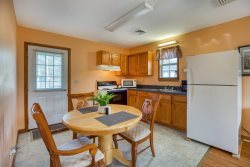 The kitchen, with Stainless Appliances, is extremely well-stocked with everything you need to make mealtime a bay breeze. You can also dine Al Fresco on the furnished Screened-in Porch or Bayfront Deck. Imagine sinking into an adirondack with a cocktail on one of the many decks as you watch the sun sink into the Chincoteague Bay. Don’t feel like cooking? The Captain’s Cove Marina Club Restaurant is just a short walk away, and the ever-popular Crusty Crab is just down the street. As you make your way to the second level, you’ll pass the Laundry Room with full size Washer and Dryer. No one likes to do laundry, but the Laundry Chute from the next floor makes it so convenient. Upstairs you will find 2 more bedrooms and a spectacular Full Bathroom. Bedroom 2 features a Queen Bed, a Full Bed, and warm cedar accents. Beautiful skylights brighten this room which also has a Flat Screen TV/DVD. The Master Bedroom will take your breath away with bright white and serene blue bedding and furnishings, incredible views, skylights, and 2 huge closets. The Master also features a Private Bayfront Balcony for you to enjoy morning coffee and the smell of the salt air. You will love watching the rhythmic light from the Assateague Lighthouse and the lights from Chincoteague Island bounce off of the water. The 2 room Bathroom on this level is awesome. In one area is a huge Jacuzzi Tub framed in warm cedar, and a large walk in shower. The second room features a dressing area, vanity area, and the other bathroom amenities. On top of 3 levels of waterfront magnificence, you will love having your own Private Dock! Enjoy crabbing in your own backyard, or casting a line and catching a Flounder, Croaker, Ray, or even small Sand Sharks at night! Bring your kayaks, jet skis, or boat and launch from the Marina, just around the corner. Captain’s Cove is loaded with amenities - a Golf Course, Indoor Pool, 2 Outdoor Pools - 1 Bayfront with Tiki Bar, Gym, Playground, Restaurant, and Snack Bar. Guests may purchase Amenity Passes for the pools by the day or the week at a minimal fee. More of a beach person? One of the most gorgeous, cleanest beaches in America, Assateague Island National Park, is only 20 minutes down the street, or take your boat to one of our awesome sand bars for your own private slice of Paradise. Serenity Now - Discover the best kept secret on the Eastern Shore!